Bangalore: The world’s third biggest container port operator, APM Terminals International BV, will invest about Rs250 crore to buy equipment and expand capacity at its container handling facility at Jawaharlal Nehru Port, or JN Port, in Navi Mumbai. “We are buying 13 new cranes and also paving 18 hectares of backup land that will boost capacity at the terminal by another 500,000 twenty-foot equivalent units (TEUs) by the first quarter of next year," Arvind Bhatnagar, chief executive officer at Gateway Terminals India Pvt. Ltd told Mint. A TEU is an industry measure of cargo containers. Gateway Terminals is 74% owned by APM Terminals, the container terminal operating unit of Danish shipping and oil conglomerate AP Moeller-Maersk AS. 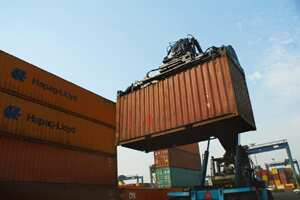 State-run rail hauler of containers, Container Corp. of India Ltd, or Concor, holds the remaining 26%. The container facility currently has 37 cranes that are used to lift containers. Some of the new cranes will be able to lift two containers at the same time. “This will improve our productivity significantly," Bhatnagar said. Gateway Terminals started operations in May 2006 at its 1.3 million TEU-capacity a year terminal. The firm won the rights to develop and operate the new terminal for 30 years starting 2006 through competitive bidding. The new facility handled 1.29 million TEUs—its designed capacity—in the 12 months to March 2008. The new equipment and yard space will help the company boost capacity to manage 1.8 million TEUs. The logistic firm’s expansion will help the port expand at a time when it is facing an acute capacity crunch. India’s biggest container port, handling some 60% of the container cargo of about 7 million TEUs a year managed at all the ports in the country, is operating well beyond its designed capacity. The port’s plan to raise capacity is delayed after it failed to finalize a contract recently to deepen its channel to allow bigger ships to call. The expansion also depends on the proposed dedicated railway freight corridor linking Mumbai with northern India. Container cargo at the state-owned port grew 23% to 4.06 million TEUs in the 12 months to March. Its three container handling facilities are designed to handle only 3.6 million TEUs. Besides Gateway Terminals, the other two container facilities are run separately by the India arm of DP World Ltd and the port authorities themselves. “There is a big demand for capacity creation at JN Port. And, it’s not easy to bridge the gap between demand and supply. So, what is required is innovative ideas and out-of-the-box thinking," Bhatnagar said.